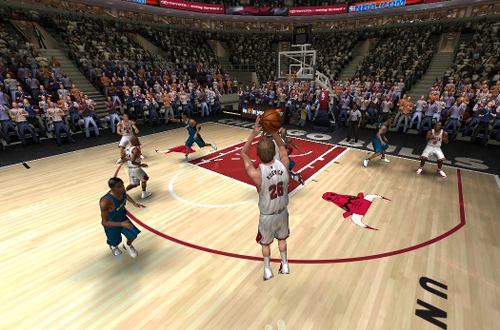 I began my NBA Live 06 Dynasty with the Chicago Bulls in January 2006, using the latest version of my roster update and my own slider tweaks. At the time, the Baby Bulls were starting to grow up, winning 47 games in the previous season and making the Playoffs for the first time since the sixth championship in 1998. They had a few promising young players in Ben Gordon, Kirk Hinrich, Tyson Chandler, Luol Deng, Andres Nocioni, and Chris Duhon. I wanted to do something a little different though, so I brought Shawn Kemp out of the Legends Pool and into the Free Agents, adjusted his ratings accordingly, and then signed him to a two year, $9 million contract. This immediately added an extra twist to the experience, and subsequently my story topic. 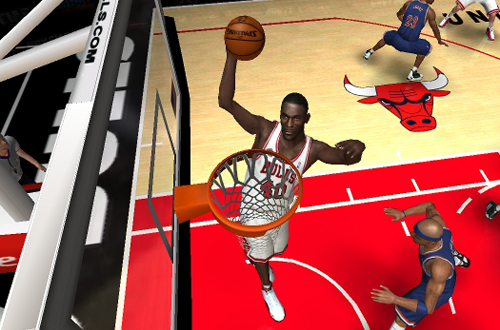 Not only was I aiming to overachieve with a young Bulls team, but I was also giving The Reignman one last shot at the NBA, and a chance to go out on his own terms. Even with an Overall Rating of 66, Kemp was still effective inside, and I found that he was often good for a modest double-double. Ben Gordon was the star of the team though, and the leading scorer with 27.3 ppg. Unfortunately, he only played in 60 games due to a broken wrist. Although his injury was a major setback, it turned out to be one of the best things that could’ve happened. Trying to replace Gordon’s scoring forced me to change things up with my strategy, as well as sign a player to fill the void. I ended up signing Latrell Sprewell to replace him, allowing me to add another All-Star and big name from the 90s to the lineup. Gordon wasn’t the only player to be injured during the regular season, making it a lot more challenging. In fact, not a single player on the team appeared in all 82 games, which was a first for me in all my years playing Dynasty mode. It definitely made the experience feel more realistic, and because I was playing with a depleted lineup at several points of the season, I tallied a modest record of 48-34. As such, I entered the Playoffs as the sixth seed in the East. This gave me a real sense of being an underdog, which was also a first for me. Whenever you play every single regular season game in a franchise mode, it’s much easier to make a mediocre team overachieve because your influence on the sticks overcomes their deficiencies. My 48-34 record, though still respectable, remains one of the worst I’ve recorded when playing every single game with twelve minute quarters. I really enjoyed it though, as it meant the season had had its ups and downs, and being the underdog felt like a fresh challenge. With that being said, I was now determined to win the championship. The postseason offered less resistance, however. I swept the New Jersey Nets in the first round, dropped a game to the Miami Heat in the second round before going on to win in five, and rolled over the top seeded Cleveland Cavaliers and LeBron James in four games. Squaring off with the San Antonio Spurs, it was battle between the two teams that were – at the time – both undefeated in the NBA Finals. Healthy and firing on all cylinders, I completed another sweep to win championship number seven. Ben Gordon was The Man, averaging 33.7 ppg for the Playoffs and being named the NBA Finals MVP, before ever winning the regular season MVP award or being an All-Star. Entering the second season, I made a few missteps. I let Sprewell go and signed Chris Wilcox and Mike Dunleavy Jr. – the latter would go on to play for the Bulls in real life years later – and while they both had their moments, neither were really the savvy free agent signings I hoped they would be. Feeling I needed to make a change, I swung a couple of deals that landed me Marty Gartner – a generated rookie who was the fifth overall pick in the draft – as well as Trevor Ariza, Danny Granger, and Eddie Gill. I didn’t feel right about bringing a prominent rookie off the bench though, so I sent him to the Seattle SuperSonics for Nick Collison. However, I still didn’t like my roster. If nothing else, it felt a bit stacked. I was also considering trading Tyson Chandler, even though he’d become the full-time starter after I moved Shawn Kemp into a bench role. I explored several scenarios, but didn’t pull the trigger on any deals before the Dynasty went on hiatus in August of 2008. I picked it up again in March 2010, as I wasn’t really enjoying the games that were out at the time. After playing it on and off for a few months, I decided to shake things up in July. The real Bulls had just signed Carlos Boozer and Kyle Korver, so I traded for them, and also dealt Chris Duhon to the Raptors for Mike James. Nocioni, Granger, Wilcox, and Ariza were also all gone. My new lineup was a lot more fun to play with. They also played a lot better than the sum of their parts, as following my fifth loss of the season I went on an incredible winning streak. I stormed through the rest of the campaign, shattering records with 53 consecutive victories, and an overall record of 77-5. I also found myself making a lot of history with Ben Gordon. He had multiple triple-doubles and even a handful of quadruple-doubles, including one against the Los Angeles Lakers where he also had an incredible 92 points. Sure, I was throwing a lot of realism out of the window in that second season, but it kept things fresh, interesting, and challenging throughout. Incredibly, Gordon was an All-Star snub. This only encouraged me to keep shooting for record-breaking numbers, and he did win the regular season MVP after leading the league in scoring, assists, and steals. He was also named Eastern Conference Player of the Month three times, and took home the Most Improved Player award as well. I swept the Pacers and Cavaliers, though a Game 3 loss to the 76ers in the Conference Finals ended my winning streak at 62 games. It also took me a long time to finish the Playoffs, as three years passed between playing Games 1 and 2! I’d gotten into NBA 2K in the interim, and ended up shelving NBA Live 06 mid-postseason. 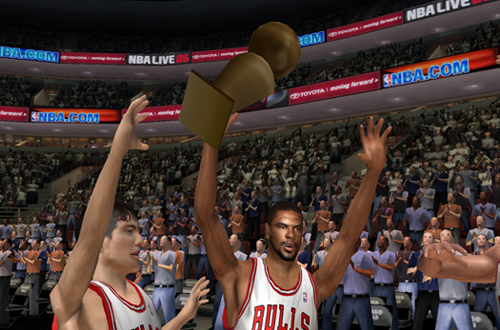 Upon picking up my NBA Live 06 Dynasty again, I closed out the 2007 season in style by sweeping the Memphis Grizzlies in the NBA Finals for title number eight. I also began my third season after missing out on all the big names in free agency. LeBron James remained in Cleveland, but Carmelo Anthony joined Chris Bosh in Toronto. A year earlier, Ben Wallace was one of the biggest movers and shakers when he joined the Charlotte Bobcats. In reality, he’d joined the Bulls in the 2006 offseason, but I had no interest in replicating that. My roster was thin as I’d let some players go to chase the marquee free agents, but I did get a promising rookie: Joaquin Arnold. 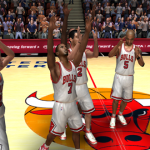 I haven’t played my NBA Live 06 Dynasty since December 2014, so it’s currently still four games into the 2008 season, with the Bulls off to a 4-0 start. I’ve had some really fun experiences with recent releases and haven’t felt inclined to dust off this old game, but I wouldn’t rule it out. I’ve kept the save file for posterity, and I’m sure there’ll be a time when I do feel like playing a few games again, perhaps simulating to move it along at a faster pace. Having played every minute of two full seasons with twelve minute quarters, I’ve already put a lot of effort into influencing the results. I wouldn’t mind leaving some of it up to the sim engine if I do pick up the Dynasty again. The two full seasons I played were as different as you could imagine, with the first being an underdog challenge, and the second being a dominant, record-setting year. I enjoyed them both however, as in their own way, they made that Dynasty game one of my all-time favourite basketball gaming experiences. 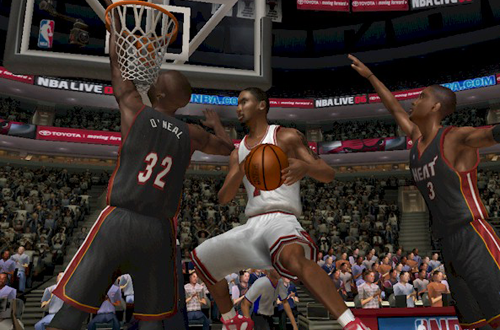 The PC version of NBA Live 06 itself is an underrated classic in my opinion, and the last great all-around release in the series to date. It’s an experience that I’ve been able to return to multiple times over the years, and one that I may yet dust off again sometime. After all, there’s appeal in the idea of taking care of some unfinished business, and getting that third threepeat.